Wowee! Talk about the witching hour! This Scorpio NewMoon before Halloween is showing some edge this year. In my location, the NewMoon peaks right at the midheaven, and Pluto sits on the Ascendant. X-ray specs, anyone? In other places the orientation will of course be different, but with Jupiter opposing the Sun bundle from Taurus no matter where one lives, we should all be feeling a little bit "haunted" right now. The sense of being stretched across widely diverging extremes is palpable. Lucky for us, we have the secret weapon of Tarot, so we can open up the issues beyond their either/or appearances. But first let me give a little newsflash: Responses to the Tarot of the Holy Light have been truly gratifying, in regards to both sales and reviews. We are still somewhat of a 'best kept secret', but it seems that mouth to ear is the auspicious advertising method of the moment. Bonnie Cehovet and Stefan Laluna have given us very kind reviews at their blogs and at Aeclectic Tarot, and also a thread has been launched at Aeclectic to talk about the deck. Allow me also to explain a few things for those who have this pack in their hands and are wondering what they are looking at. I'm also addressing those who are still wondering whether they could use The Tarot of the Holy Light the way they do their other Tarots. It is clear from the conversation at Aeclectic that some people are concerned that the Continental correspondences might be too foreign for them to grasp and use adequately. The full book is not out yet, but we have included enough details to the faces of the cards to stir up curiosity about the paradigm we are working in. So let's kick the tires for a minute and pore over the details of this little rig! We have already noted that the pictures speak a thousand words, and nobody is obligated to follow up on the occult notae. Please take this seriously. THL is a great reading deck made by people who know what they are doing. 'Nuff said! However, for those big-brained types who can't leave well enough alone (said affectionately, as I am among this group), here's some hard data to meditate on. I emphasize the equation of Tarot because everything pertaining to "correspondences" is held there. No matter what Tarots a person cut their teeth on, the esoteric contents of the Tarot have to fit comfortably within this frame. Every example of "esoteric" tarot from Etteilla forward (and even before Etteilla, as we are learning by hindsight) had to conform to this model, or else it's not Tarot. For example, the Trumps appear as a set of 22 consecutive units, no matter how they might be grouped within the set. That sequence can be constituted as 4 groups of 5 with two freestanding Trumps that open and close the set, as J. C. Flornoy teaches through his restored Jean Noblet Tarot de Marseille. Alternately we can envision the Trumps set as a great flower with three petals at the center, seven petals surrounding that, and twelve petals completing the face of the flower -- a reliable sign of exposure to Hebrew Kabalah teachings. Manly P. Hall's Secret Teachings of All the Ages shows the Pythagorean Tetractys unfolded to six levels, each position holding one Trump while the Fool forms a backdrop and ground for the 21. Irene Gad explicates the Trumps as a 10-stage descent from the Infinite to the finite, followed by a 12-stage return for the sake of self-repair and individuation. All of these approaches add meaning to the Trumps, but they all depend upon the constant that they collectively observe, which is that there are 22 standard units appearing in a certain standard order. In the Tarot of the Holy Light we are using the model of 3 rungs of 7 steps, mirroring the musical 3-octave coil (with final do) that the Hebrews projected upon their alphabet. The testimony of history seems to settle on this 3x7 model no matter which of the three earliest orderings the Trumps might appear in from deck to deck. Plus, my astro-alpha-numeric chart reveals that all self-described esoteric Tarots of the last 300 years derive their structure of correspondences from the Hebrew Alphabet, however denominated. Therefore, despite the tremendous range of flexibility to how different teachers might group the Trumps within their numbered order, the constant of Tarot is that there are 22 of them, arrayed in alphabet order, each one endowed with its own unique image, number, letter and title. What this means is, if a person had any exposure to the astrological Wheel of the Year, with its 12 Signs, 7 visible Planets/Lights, and 3 modes (analogous to the 3 base substances in Alchemy, keyed to the three "mother letters" in the Kabalah), then they would have a basis for understanding the Trumps according to the Hermetic Cosmos of antiquity. Due to the fact that we find Tarot Trump correspondences reflecting alphabet-ordered schemes since the late 1700's, I personally have no doubt that we will find the Trumps to reflect the ancient syntax of the Magical Alphabet that informs all of the ancient tongues. It is only a matter of time! While we await that immanent development, a little time spent with Agrippa will equip the reader with a historical grasp of how a set of 22 alpha-numeric units would be understood in the world of Tarot's early signifiers. When I finally manage to get my talk for the Conference on Tarot Esotericism converted into a movie I can show from my website (a rather more difficult process than I had first imagined), readers will see the amazing alchemical theory and praxis built into that 22-term Wheel of forces and relationships described in the Hermetic Cosmos diagram, which are therefore bequeathed to, and inherent within, the Tarot Trumps. You'll see why I feature and promote the Continental correspondences that Etteilla taught his students as the AAN net for his Trumps. 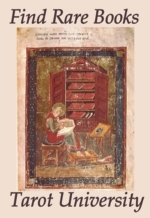 According to my research, Etteilla was correctly reporting on a mature body of esoteric teachings that was already several centuries old by the time he popularized it. The fact that Etteilla's arrangement fits dimensions of, and articulates all of the operative units of, the larger interdisciplinary praxis lets me know in no uncertain terms that this is the key in the lock of Western Esotericism. This cannot be an accident, folks, we now have our historical ducks in a row! It will no doubt take years to fully explicate the whole complex of interpenetrating systems, but for now what we can know is that Agrippa's tome on magic is the checkerboard floor of Paracelsian astro-alchemy. On that basis, Paracelsus constructed a foundation and laid out a building plan which Jacob Boehme took up, and upon which he constructed his Theosophical yoga of the Restitution. This complex of views, practices and tools has come forward through the Lodges and Orders of Masonry and Rosicrucianism, and it is the same paradigm that Etteilla revealed to his students upon his Tarot. But again, only the historians of esotericism need to take all this stuff personally, and follow the details down to the nubs. For the THL user, the best way to take advantage of this knowledge is to link the THL Trump cards with both the components of the user's birth chart, and with the planets moving through space and time overhead. This way one is able to literally triangulate among the world of astral influences (the planets in their cycles), the subjective world of the imagination (the Archetypes of the Trumps moving in the psyche) and the material world of physical outcomes (the manifested universe taking shape around us). This trinity reflects the "three worlds" paradigm that one often finds with the continental Tarot teachers from Etteilla through Eliphas Levi, Anonymous (Valentine Tomberg), Mouni Sadhu and Papus (among others). I'm not advocating any kind of "belief" or "faith" in one system over another, simply the practice of watching, and comparing notes between one's cards, one's chart, and one's transits. This can be done with any Tarot pack that sports a full body of correspondences, but for myself the only system that reports literally on this link between heaven and earth via my personal chart has been the Continental system. And since undertaking the fine-tooth-comb investigation required to complete the Tarot of the Holy Light, it has become clear that the oldest Continental variation I could find, that of Etteilla, is also the most comprehensive system to be had from among this group's variants. In terms of passing on functional correspondences rather than just thinking about them abstractly, Etteilla was clearly sharing a key that subsequent exponents nicked and tarnished; this is my conclusion. A first introduction to the overview of what came to Etteilla through Masonic Theosophy from the pen of Boehme and his students will be found in my book, never fear. Meanwhile, the ground-floor correspondences necessary to work the interlocking astro-alpha-alchemical-kabbalistic-numero-geometric system are clear on the faces of the Trumps, and in the LWB for the Tarot of the Holy Light, so people can begin to get used to making these associations as their own intuition allows. This same sort of logic permeates out to the Royals and Pips as well. The Royals are given to the straightforward Zodiac, as 12 Roles that the Zodiac offers to human civilization for cultural and individual progress. The Queens are the Cardinal signs of the 4 elements, the Kings are the fixed signs, and the Knights are the Mutable signs, leaving the Pages to represent the Solstices and Equinoxes (and their subsequent seasons). Projecting these natural modes upon the Hebrew Tree diagram for each element (which we do with the numbered Pips) means that the Supernal Triangle (ace, two, three) carry the three decans of the Cardinal sign, the Heart triangle (4, 5, and 6) carry the three decans of the Fixed sign, and the Pelvic triangle (7, 8, and 9) carries the three decans of the Mutable sign. This leaves the 10's to serve as the materialized receptacle of each element's action -- the Malkuth, if you will, of each elemental world. I think of the Royals as people we interact with in the psychological world of culture and self-discovery, whereas the numbered Pips represent the Natural Laws and evolutionary stages that everything in nature goes through in the course of working potential into actual. Thus the three species of cards we encounter in Tarot can easily be identified as the Big Ideas, important Human elements, and pivotal Events that impinge upon our individual reality. People who love the deeper esoteric minutia can immerse themselves in the inner workings at the ArkLetter articles The Shem Angels; Clues to a Lineage at http://noreah.typepad.com/tarot_arkletters/2007/03/shem_angels.html and The Stoicheon-Somata Schema (especially the 2nd half, on Decans, Horas, and their distribution on the Pips) at http://noreah.typepad.com/tarot_arkletters/2007/12/stoicheion-soma.html. Between these two the overall astrological matrix of the suited cards in any form or "school" of Tarot is explained. However, when assembling the Tarot of the Holy Light, I had to blend this astro-alchemical and angelic system with the dynamics of the Kabalah Tree and the effects of the Lightning Bolt, which introduces yet another layer of complication to the astrological correspondences on the Pips. The specifics of that is one of the topics to be unfolded in the upcoming book. For Tarot readers in the modern sense, the only correspondences needed on the faces of the Pips are the Signs of the Zodiac, the decanates and their elemental rulers, plus the Solstices and Equinoxes. Readers can take these degrees and their rulers as the "givens" of a situation from the cards' point of view. Someone who already has their own grounding in the matrix of astrology, which is truly a sister-art with the Tarot, should have no trouble just working with the deck as they find it. Am I making myself clear so far? Time will tell. 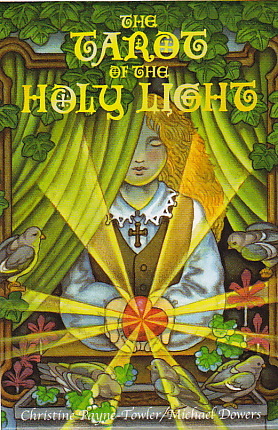 The Tarot of the Holy Light is a reader's deck at the first level, a teaching deck at the second level, and a true multimodal shaman's computer at the third level. Best to get used to it at the simplest level first, feeling out its base premises first before trying to climb the Ladder of Lights all at once! It's utterly unnecessary to bother oneself with levels two and three if one hasn't become comfortable in level one first. Early adapters will just have to trust me, just like everybody trusted Waite and Crowley implicitly over the years, even when these fellows were straining esoteric credulity with their broken paradigm. Throughout the seven years' worth of montly writing I've created in the Tarot Arkletters, I've done the heavy lifting for you, by systematically restoring the numbers, elements, signs, planets and alphabetic ordering of the Trumps back to the older Tarot model again, from which it was originally taken. Michael and I have built this Tarot upon the bedrock of western esoteric praxis, using the oldest and most defensible foundation bequeathed to us from Tarot's time of origination. Our only adjustment from the mold left by Etteilla is that we smoothed out the astrological relationships between the Suit cards and the astrological Wheel. Etteilla is no longer here to question on the subject of his "Tarot fine print". Even though Papus did an admirable job trying to summarize Etteilla's legacy a century later, he only put minimal energy into explaining the suited cards, which leaves us with many loose ends. People have put a lot of effort into understanding his exoteric "game of Tarot", but this then stands as a distraction to the job of unlocking his inner teachings that he shared in his private classes. This subject really demands a scholar with a background in Masonry to fully explicate the magical worldview and praxis that Etteilla poured into his Suited cards, and I am not that person. Lacking that, Michael and I decided to concentrate on the inherited Tarot/astro/Kabalistic/alchemical interface of the Trumps (which is the purely Tarot component of the 78-pack deck), and leave Etteilla's quirky uses for the "playing card pack" to a future researcher. What we retained from Etteilla's Pips pack is what everybody has inherited from Etteilla -- the divinatory meanings of the individual suited cards, which continue to shape the interpretations of both esoteric and non-esoteric packs to this day. By no means have we abandoned any of the esoteric elements Etteilla used to justify his pack, heaven forbid! But it was necessary to de-complexify parts of Etteilla's armature, to the extent that they interfered with the transmission of the larger interlocking paradigm. In the case of the numbered Pips of the THL, each card covers one decanate (a space of 10 degrees) and holds two contiguous Angels. These values have no application to the divinatory use of the cards, so we didn't feel obligated to pass on Etteilla's unnecessarily complicated variation on the Angels, especially when Tavaglione has already laid out the bones of that application in the LWB for his Stairs of Gold Tarot. People who want a pack with Etteilla's angelology on the Pips can work with any Etteilla pack, the Stairs of Gold, or the Papus Tarot. I'll warn you though; nobody explains the logic behind why he or she uses this method, or where it comes from. I do not doubt that we will learn more about Etteilla's vision as future devotees drill down further and translate the rest of his writings, but until that time, the THL can be thought of as offering an introduction to the esoteric elements that combine on the Tarot according to Tradition between Boehme in the early 1600's and Etteilla in the latest 1700's. The fact that the alchemical art of the 1600's managed to lead us to a higher level of esotericism than had originally been conceived for the pack still blows my mind -- make no mistake! This boon and blessing will reward those intrepid enough to follow it through. Nevertheless, there is no penalty on those whose style of usage doesn't stretch to those extremes. For general application, right out of the box, this is a deck that talks right through the pictures. For those who care to, one can also project their cumulative experience with the original, historical packs into the Tarot of the Holy Light, as the cards will easily reflect and amplify the original core ideas. Beyond that level, if a person is motivated to go further into the whole alchemical paradigm, they will find a bottomless well of esoteric wonderment, but we don't insist that everybody learn that dimension before they can work the cards in a normal setting. 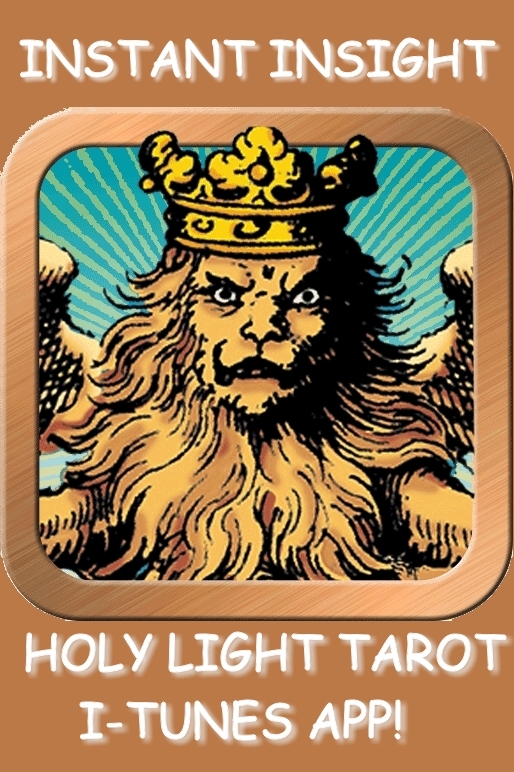 The Tarot of the Holy Light very self-consciously represents the paradigm (or occult hologram) of the Protestant theosophical astro-alchemistic Christian Cabalists. We convey this first and foremost through interweaving the visuals from this school into the collages, since a picture is worth a thousand words. We know that people have enough to assimilate just with the fresh imagery and the restoration of the Continental matrix. The two articles I have recommended will demonstrate that there is more than one way to distribute the Hermetic Cosmos through the Pips. But in the end, the same categories of meaning are covered in every case -- the Signs, Planets, Elements, and Numbers, plus the divisions of each sign by 3 and 6 to produce the Decans and the Angels. Once one knows that these are the core values that every esoteric Tarot is using in common, then one can relax and just roll with the adjustments one encounters from one deck to the next -- they are all talking about versions of the same thing! The secret is to unzip one's understanding of the Signs, Elements and Planets from the OGD matrix, and become confident in one's astrological knowledge on its own footing, as a self-standing discipline of its own. The astrology of history has never depended upon Tarot -- Astrology appeared millennia earlier in humanity's development, so it is only logical to understand that Tarot rests on the ancient foundation of the astrological number-letters, rather than trying to understand things the other way around. Having said all of this, you are now equipped to see what I have just recently discovered: There is a typo on the Tarot of the Holy Light deck: The planetary rulers of the 7 and 8 of Wands got turned around before it went to the printer, and we failed to discover the snafu in time. We succeeded in catching the printers in a monstrous error that would have spoiled the entire print run, so I've got this little flaw in perspective and am not dying of mortification over it. The fact that nobody has yet mentioned it to me demonstrates that it's only going to disturb a very few people. However, I have to confess to it because I've got it written up correctly in the book, and I want people to be able to use and appreciate the elegance and magical clarity of this paradigm at its highest expression. I'm also the stickler who has pointed out the errors in other's Tarots, so I'd better be able to admit to my own failings right out of the gate! I'm sad and sorry about my typo, and any future editions of this pack will be corrected. But it's easy enough to make a note in the LWB that the 7 of Wands represents the Mars-ruled decanate of Sagittarius, while the 8 of wands represents the Sun-ruled decanate of Sagittarius. A fine-tipped Sharpie will correct the faces of the cards themselves, if you are one of those adventurous types who are willing to write on their cards, as I am. Think of it this way -- this little flaw is your proof that you have a copy of the original printing of the deck! 100 years from now these "perfectly imperfect" packs will be worth a small fortune, at least we can dream it were so! Sun and Moon, Mercury and Venus in Scorpio = The Fool, The Priestess, The Star and The Empress in the realm of Temperance. Doesn't this look like a perfect gaggle of goddesses, herding their Fool (The Sun, the ego) before them? And the goddess who is Large and In Charge right here is Temperance, symbol of the alchemical furnace and maker of healing tinctures. When the ego has the presence of mind to stop in its tracks and consult with Sophia of the microcosm (the Priestess, AKA the still small voice within), ego will reap the guidance and wisdom of The Star (the Hermetic or subtle Mercury, avatar of intelligence) and the Empress (Venus), who always shows things in their true and eternal light. It was Paracelsus who declared that the dosage is what differentiates a medicine from a poison, and this is the very awareness that Temperance brings to her labor of rendering experience into consciousness. There is no gain to be had by pushing the ego faster than it can assimilate its experience and grow in wisdom. Time is a big part of the recipe for healing and evolution. All of this gentle culturing and subtle influence exerted by the Moon, Mercury and Venus will slowly be integrated by the Fool to help stabilize his growing inner sight and intuition. Mars in Leo = Strength in The Hermit's realm. The immediacy of Strength's outpouring of passion and power can seem overwhelming to a person who has been locked up and stuck behind longstanding blocks to their will. But Strength is the untrammeled energy and self-empowerment available to a person who lives their truth without limitations. With Mars in the sign of the Hermit, we have moved the focus of the will to a realm where all of the external controls imposed by communal living and materialistic focus have been lifted. Out in the hinterland with the Hermit, the great urgency of Mars' desires and demands can come to the surface and pour forth unashamed and uninhibited. It might feel a little shocking, or then again it might be just what the doctor ordered. Either way, once the dam has burst there is no stopping the flow, so we can all finally know and see and share what is truly moving us, giving us our motivation, and calling forth our unique individual genius. Jupiter retrograde in Taurus (opposing NewMoon) = Emperor in the Lovers' realm. This Jupiter is currently retracing his steps across the first 10 degrees of Taurus, and for some of us that represents a frustrating slowdown of our creative projects. But his current passage through Taurus is bringing good fortune anyway, because he's stirring up this lush and fertile early spring sign (relative to the Northern hemisphere anyway), where winter loses its iron grip and the days become noticeably longer, if not warmer. The sign of Taurus is traditionally the time for plowing, sowing and the sprouting of seeds, so we can look forward to Jupiter plowing new furrows in our private potential and seeding fresh potentials, at least once he recommences forward motion in the last week of December, 2011. During the time when the retrograde still prevails, we can act like good farmers and clear our 'ground of being', removing any besetting obstacles that would inhibit a fresh expression of this spring like energy. Jupiter is giving us until December to decommission the blocks that would hold us back, and then we have till mid-March of 2012 (when he finally gets back to the degrees he attained before the retrograde began) to become habituated to our new goals and intentions. Jupiter is traditionally the Great Benefic, so it behooves us to cooperate with his plan and get ready now for the growth spurt being arranged for next spring. Also, Jupiter is exactly opposite the NewMoon in this month's chart, giving us the reminder to fulfill our Jupiter retrograde duties no matter how attention grabbing and emotionally "sticky" the collective, social, political, or planetary problems become over this month. None of us can afford to waste too much time being swept up into the mass distractions constantly bidding to shred our focus and stall our evolution. Time and energy are limited, that's the simple fact of life in this here material plane, so have your own priorities at the top of your list no matter how strong the forces are that pull towards fragmentation and/or anesthesia (any and all 4 of Wands issues). We don't have to move fast, but we have to keep moving towards our goals, so we don't turn into pillars of salt, immobilized by the enormity of our world's ongoing mutations. Express any discomfort you are feeling by clearing out old logjams and stuck energies, so you have some space around you in which to gestate the new endeavor as it comes into focus. The best way you can help the world is to not become a burden to others. Therefore, as much as possible try to work out your own salvation with materials currently at hand. Saturn in Libra = Judgment in the Hanged Man's realm. Speaking of the burden of time, Saturn is Chromos, lord of Time fate and karma, also known as the Lord of Obstacles. In antiquity the planet Saturn was viewed as a Satan or Divine Tester, in some measure because of the boundaries and restrictions that time, gravity and attrition place around the immortal soul. The beautiful part of this planetary pairing is the equilibrium, poise and serenity reached by the Hanged Man in Libra, as he meditates within the abyss of Time, symbolized by the Orouborus serpent wrapped around him. According to the ancient rulership system of Essential Dignities, Saturn is exalted in Libra, meaning that Saturn experiences an especially favored environment in this sign. Saturn in Libra signifies that you can relax in time, you can trust it, it reliably pulls us all along at a steady and predictable pace, we are all in this together and nobody is immune. What is not solved, not clear, not perfect yet will become so "in the fullness of time". Across time, a soul has the chance to meditate and digest, make associations and see the larger pattern. This is why evolution is reserved for creatures of Time. Time puts the brakes on the ceaseless immanence of Eternity, by wrapping the soul in neuro-wetware and embedding it in a planetary ecosystem. This forces the appearance of consecu-tivity upon what is essentially ultimately all-one. We get to stretch out our experiences (or lifetimes) like pearls on a string, instead of being inundated with everything simultaneously. Transiting Saturn has completed his retrograde for this year, so in that sense too he is feeling comfortable and fulfilled in this placement. We have now finally recovered from the challenges he was putting us through during his retrograde from late January to mid-June of 2011 of this year. This Hanged Man, who appears to be voluntarily traveling through psychic space while suspended upside down in a bubble of subtle energies, is gratefully embracing the discoveries he is making while witnessing the play of the Archetypes, etched by spirit out of energy and light. The oval of the serpent on the Hanged Man card is mirrored by the wreath of crossed boughs in the Judgment card, suggesting that in the fullness of time there will be a resurrection and restoration. During this restitution or reparation (which appears to be the gift of Saturn), it is suggested that all our lost potentials and derailed visions will have their chance to sprout and bloom under a more supportive sky. This helps us understand that the very same force that seems to restrain us now, slowing our steps towards our goals and visions, is also the force that will carry us towards our eventual success, moving at this same implacable pace. Since we are creatures of eternity first and creatures of time second, nothing can be denied us so long as we keep our focus on our goals rather than on our current circumstances. The Libra implication adds the nuance that by entering into the current of time consciously and communally, as the OWS movement is doing, we can all help steer the direction of the future from within the current itself. All we have to do is show up and be heard, wherever our own urgency tells us is the epicenter of the action. The common denominator of all of these icons is that we are now being guided to individuate as fully as possible. It is time to take our unique, quirky, and asymmetrical selves as seriously as we can, despite the pressures coming in from all sides. There is a reason that each of us has entered the present in the exact shape and dimension and vibratory pattern that we hold. If we don't yet realize precisely why we are who/what/how we are, that may not matter so much. What matters the most is being fully present, feeling what we feel, and responding to our feelings authentically, in a way that satisfies our real and essential selves. The whole NewMoon bundle in Scorpio focuses us on the internal process of transformation that is heating up and melting together in the Alchemist's lab. Meanwhile, Jupiter opposite NewMoon in Taurus makes sure to keep us grounded in our bodies and our immediate circumstances, so we never forget that our actions and non-actions have consequences in the literal world. Mars counsels a hearty response to everything that moves you, whether pro or con. Lukewarm passiveness and tuned-out ignorance cannot be maintained while Mars transits Leo, the opinionated and flamboyant sign of artists and performers. Let's dramatize the positives and keep the collective focus right there, instead of buying the canned brainwash-o-tainment that comes to us over the mass-market channels! And finally, let us take it to heart that in the long run, we will follow the route we have always been traveling, from long before time and long thereafter. The soul is the victor no matter what ups and downs Time records, because the inner Light cannot be extinguished, no matter what outer appearances might suggest. Therefore we can relax and let go of our fears, even our fears of being stuck in a bad scenario. Whatever fate decrees for the body, the Soul can be sure that its immunity to true harm is inviolable. From this position of safety, one can survey current circumstances with detachment, and respond from a soul-deep liberty that is forever free from worldly coercion. From Saturn in Libra's point of perspective, a larger Truth comes into focus, answering the who/what/wherefores that the mundane world will never be able to address. Many blessings of the seasons, including All Hallow's Eve, and later the Thanksgiving Eclipse. NewMoon at 3+ Scorpio on Wednesday, October 26th, at 3:57 PM (EDT) / 12:57 PM (PDT). From this moment, the Moon begins to wax, or increase. 2nd Quarter, Waxing Half Moon at 9+ Aquarius on Wednesday, November 2nd, at 12:39 PM (EDT)/ 9:39 AM (PDT). Daylight Savings Time ends at 2:00 AM of Sunday, November 6th. Full Moon at 18+ Taurus on Thursday, November 10th at 3:17 PM (EST) / 12:17 PM (PST). From this moment, the Moon begins to wane, or decrease. 4th Quarter, Waning Half Moon at 25+ Leo, on Friday, November 18th at 10:10 AM (EST) / 7:10 AM (PST). Next NewMoon Solar Eclipse at 2+ Sagittarius, on the night of Thanksgiving, over the midnight hour of November 24th, 10:11 PM (PST)/ November 25th, 1:11 AM (EST). From this moment, the Moon begins to wax, or increase. my sincere thanks Christine, for this, and every new moon Tarotology you do for all of us. am very excited about your new deck, and will be ordering after the 1st.